What is the “critical situation”, and how did it come about? Expenditure projections for library resources are showing a current shortfall of $1.3M which is increasing with the continued fall in the value of the Canadian dollar. The amount is partially covered by one-time “emergency” funding of $752K committed at the start of the fiscal year by the University Administration. However, a rapidly deteriorating Canadian dollar has significantly and speedily undermined our purchasing power. At the end of June, the CAD/USD rate was $0.8022 and by the end of September, it had decreased to $0.7466. The Libraries’ exposure to changes in foreign exchange rates is roughly $40,000 per $0.01 change in the CAD/USD rate. Currently, the annualised loss of our purchasing power from the beginning of the fiscal year is roughly $400,000. This is a university-wide problem that, if not addressed, will have a significant and negative impact on research and teaching at UNB. We are attempting to minimize the impact for the remainder of this academic year. However, major reductions in purchasing will be required in 2016-17 if circumstances do not improve. This would lead directly to the cancellation of resources – electronic and print. Is foreign exchange the only problem? The drop in the value of the Canadian dollar is the biggest culprit with regard to the size of the projected deficit, although exposure to foreign exchange has exacerbated a problem that existed already. Even in an “at par” environment (where the US and Canadian dollars are of equal value), the acquisitions budget would still be short by roughly $400K. Roughly half of our acquisitions budget has been partially protected for inflation at 3% a year, while the nominal inflation on library resources hovers at 5%. The other portion comes from many sources, most of which have been static with respect to inflation for years. Our purchasing power has therefore been diminishing for years. We have only been able to make ends meet in recent years because of the once strong environment for the Canadian dollar. 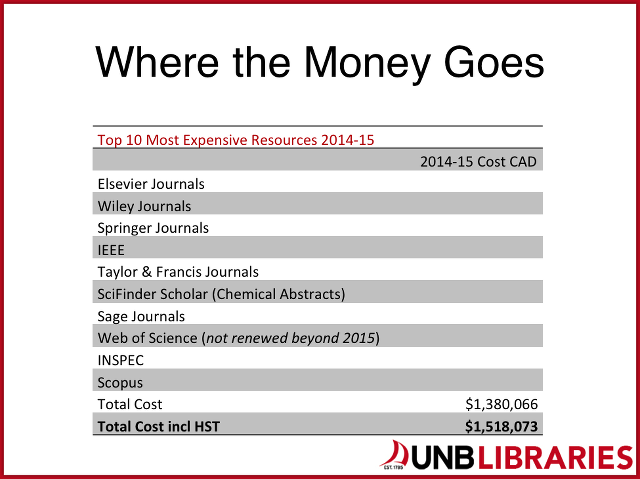 Our ten most expensive resources in 2014-15 ate up almost $1.5M of our acquisitions budget. 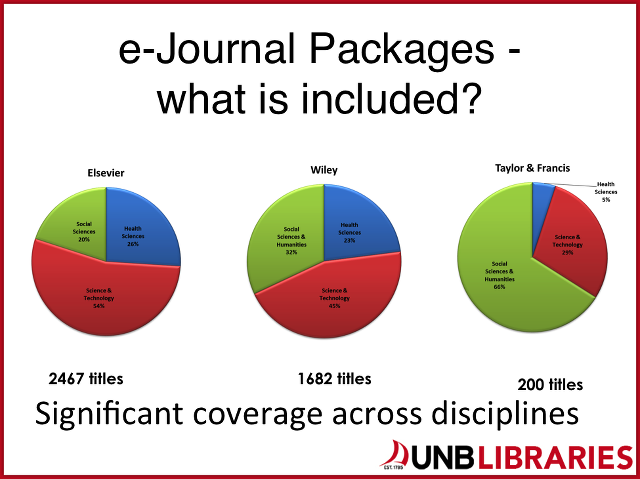 Those resources include items such as e-journal packages (Elsevier, Wiley, Springer, IEEE, etc.) and databases (SciFinder Scholar, Scopus). 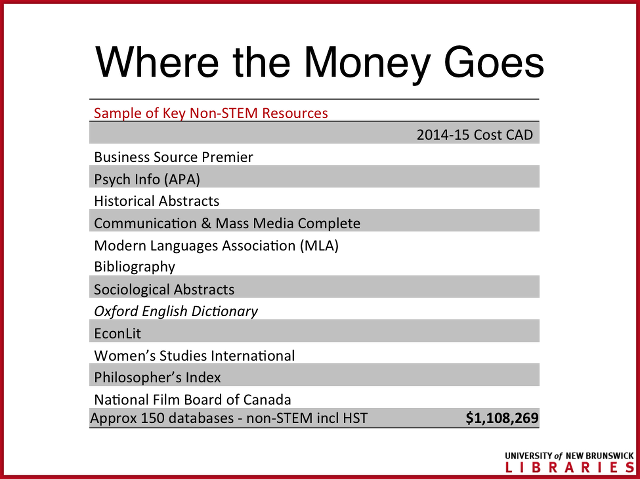 Many of the more expensive items serve the STEM disciplines, although not exclusively. HST alone on the electronic resources cost the library $300K last year after taking into the institutional HST rebate. How are non-STEM disciplines supported? We license approximately 150 databases serving the Humanities and Social Sciences, many of which are subject-specific (Philosopher’s Index, MLA Bibliography, PsycInfo, Business Source Premier, etc.) and which collectively added up to another $1.1M in that same year. We spend a further $300K - $400K on monographs and print reference sources. What is an e-journal package? Can we partner with other libraries to obtain better prices? We do. Since 2000, UNB has been a member of the Canadian Research Knowledge Network (CRKN), a consortium of 75 academic libraries who band together to negotiate the best prices possible for the resources we collectively license. In 2014-15, more than $1.6M of our budget was spent through CRKN which as a national organization focusses on the acquisition of big-ticket items. We are also a member of the Council of Atlantic University Libraries (CAUL) as well as an affiliate member of the Council of Prairie and Pacific University Libraries (COPPUL) through which we license some 40+ databases. We work with whomever we can to obtain the best price. How much value do we get out of our CRKN membership? Could we go it alone and license just what we need? Through CRKN, we license access to scholarly journal packages (often referred to as the “Big Deals”) which provide us with access to thousands of titles. Prior to CRKN, we subscribed to a mere 622 titles from eight scholarly publishers (Elsevier, Springer, Wiley, Sage, Taylor & Francis, Oxford, Cambridge and the American Chemical Society). With CRKN, access has grown to 9,247 titles for this same group, for scarcely more than the price of the original titles individually subscribed. Clearly UNB was underserved in the days of title-by-title subscriptions. To withdraw from these CRKN agreements would severely limit our ability to support today’s research needs. Could we save money by relying more on Document Delivery rather than subscription to the Big Deals? No. Document Delivery is just not possible on the scale that would be required. Doc Del processes over 1,000 requests a month now, at an average cost to the library of $11 a transaction (including costs associated with staffing, delivery, and service agreements). Our usage statistics show article downloads of 186,000 for Elsevier alone in 2014, at a cost of about $2 an article. It is obvious that this number of downloads would not translate into the same number of Doc Del requests, but the library couldn’t process even 10% of that number without adding staff and affiliate costs for which there is no budget. What will the consultation process be if cancellations are required? Liaison librarians will be working collegially with library representatives to determine the most critical resources, and those without which we would still be able to manage. We hope to maintain all key resources, but recognize that will not be possible if current financial circumstances do not change. In the event that cancellations are required, our objective is to focus on resources that have been identified through consultation as less crucial. Having said that, we don’t believe that there are many non-essential resources at this point. In January a survey will be sent out to help identify resource priorities. No, not at this point. We are encouraged by the impact Open Access is having on some particular disciplines, but it has not yet become a reliable and recognized substitute for licensed resources. We are actively supporting Open Access solutions, as a means of preparation for the future. What groups have you met with? Live within the constraints of our current budget for library acquisitions. This will mean significant cancellations of library resources – online in addition to print. This is beyond the control of the library. Emergency funding was already committed to library acquisitions in the spring, but that is now insufficient. Again, this is beyond the control of the library. This is a question for the university community – are there potential new sources of money? Where are the journals that I linked to from Web of Science? When we lost access this year to Web of Science the impact was misunderstood by some to include a loss of access to journal articles. That is, in fact, not the case. You need to know exactly what is being cancelled, and what alternatives are available to library users. It may help to provide a simplified overview of the kinds of materials the Libraries purchase, and the connections that we build so that users have seamless access to one from another. We organize our resources into broad categories: books (either print or electronic), journals (either print or electronic), other content, reference sources, indexing and abstracting databases, and citation analysis databases. The table below may help to illustrate these divisions. We purchase these separately, and although some serve beyond their initial category (one can find the full text of some journals in certain databases, and one might use Web of Science to locate publications), each is purchased to assist researchers within the context of its intended category. When we cancelled Web of Science, we lost its use as a citation analysis database (and although we realize that the loss of this resource creates difficulty for researchers who wish to track the impact of a given publication, Scopus is identified as an alternative resource). We continue to have the journals that were linked to from within the database. If you used Web of Science as a discovery tool, you will find very good alternatives in the Subject Guide for your discipline. We thank you all for working with us at this time. If questions arise, remember that your liaison librarian is available to help you, as is our online AskUs service. Who can I contact with my questions and comments on these issues?